UPDATE, NOVEMBER 4, 2016: Baglietto is now also collaborating with the studio Santa Maria Magnolfi for new projects. Those, plus the below-mentioned Baglietto 44m versions by Hot Lab and Francesco Paszkowski, form the Baglietto V-Line. Santa Maria Magnolfi is showcasing 41-, 50-, and 55-meter (135-, 164-, and 180-foot) designs. Each preserves signature Baglietto features, like twin round ports on the main deck. But, each also can be semi-displacement or full displacement, and tailored to buyers’ tastes. 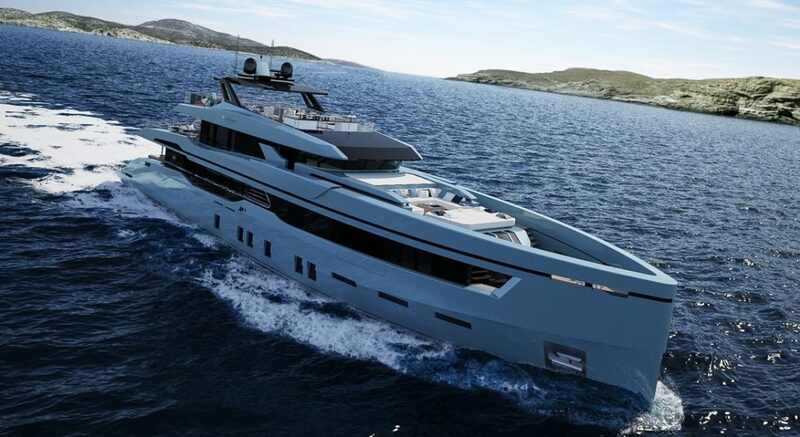 Baglietto has a new series strongly focused on the 131- to 164-foot (40-to 50-meter) segment, offering diversity in styling and interior design. The flared bows, vertical bows, and other eye-catching aspects are penned by leading designers. The yard even has multiple designers working on each model. They are all part of the Baglietto V-Line. For the first new project, the Baglietto 44m (144 feet), you can choose between designs by Francesco Paszkowski and Hot Lab Yacht & Design. While both studios created vertical-bow profiles, there are still differences. Compare the one from Hot Lab above to the one from Francesco Paszkowski below. The former has slightly raked wheelhouse windows, while the latter has vertical ones. Hot Lab made the bow higher, too. Differences also exist in V-Line guest spaces. Paszkowski devotes the transom to beach-club use. The sundeck beckons owners and guests to spend most of their time there, since it comprises 1,076 square feet (100 square meters). A pool and big sunbathing area are at everyone’s disposal. To complement the full-beam master stateroom, two guest staterooms can convert into one big full-beam suite. Meanwhile, Hot Lab offers a tender garage aboard the Baglietto 44m. The door lowers for toys to deploy, and to create a big bathing/relaxing platform. A clever feature is the skylight in the master stateroom, which spans the full beam on the main deck. The skylight is actually part of a table on the sundeck. Hot Lab also gives the Baglietto V-Line 44m a master-suite balcony, accessed through a glass door. No matter which designer you prefer, the Baglietto 44m is an all-aluminum semi-displacement megayacht. Top speed should be 20 to 22 knots. Best range should be 4,000 nautical miles. Hybrid power is an option as well. 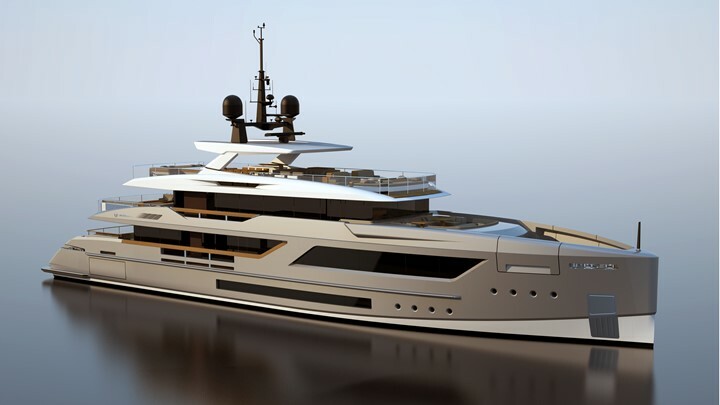 Interestingly, Baglietto has a steel-hulled version in the works, but is keeping draft Bahamas-friendly-shallow. Furthermore, Baglietto is studying smaller and larger V-Line models. They, too, will be all-aluminum semi-displacement projects at first, with steel versions coming later. The LOAs are 135 and 164 feet (41 and 50 meters). “This new series is part of a far-reaching renovation process, which started off with the 46m Fast and aims at bringing the ‘seagull brand’ closer and closer to market demands,” says Michele Gavino, Baglietto’s general manager.